Interim queuing system is the latest in string of innovations to enhance customer experience. 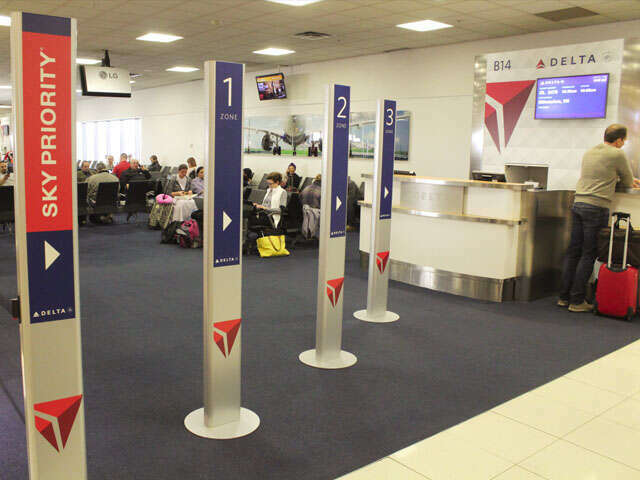 Customers traveling through B Concourse at Atlanta’s Hartsfield–Jackson International Airport today will notice a more streamlined boarding process at five Delta departure gates. The latest upgrade to the boarding process features branded pillars to create four parallel lanes, keeping customers out of the walkway and providing a separate queuing area for Premium customers and those needing special assistance. The airline plans to roll out this interim solution to additional airports if customer feedback continues to be positive. As Delta develops new solutions to improve the boarding process, the airline looks to take the “hold room” feel out of the gate space and create an interactive area full of meaningful distractions that keep customers engaged and entertained while they wait.